An exciting new avenue of research has opened up that could help us unlock the secrets to the universe itself. It is the age old question about our universe, and that is why there exists anything at all. It is a question that has vexed philosophers and scientists alike since the beginning of time, and now researchers think they have come up with a rather disturbing conclusion: we should not exist at all. There is one major problem with that conclusion, in that we do exist, and that is why the question is so intriguing. While every piece of evidence suggests that the universe should be a totally featureless expanse of nothingness, it is filled with stars and planets and even life forms capable of contemplating their own existence. And that is where we get to the latest breakthrough. Scientists took 65 pounds of germanium, a rare isotope, and cooled it to extremely cold temperatures about a mile underground in some gold mine that has long sing been abandoned. They call it the Majorana Demonstrator, and it is located in South Dakota at the super secret Sanford Underground Research Facility. Scientists believe the key to understanding the reality of existence at all lies in our understanding of the matter and energy that make up our universe. They currently operate on the Standard Model of physics, which claims that all matter in the universe should have an equal amount of antimatter counterbalancing it. But we have been unable to detect this antimatter, which is strange. 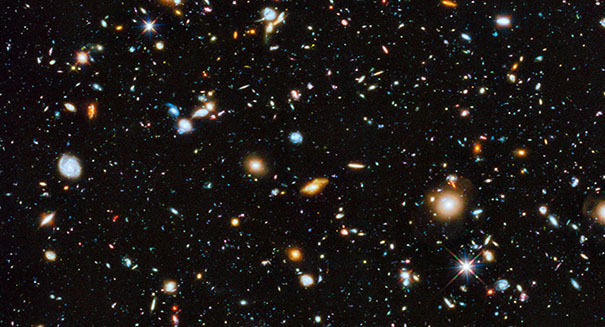 The question of why the universe is made entirely of matter is a very strange one. Where does this antimatter exist? And that is the key problem: scientists have no idea. One intriguing clue that scientists are following are things called neutrinos, which are type of nculear radiation that happens when an atom decays, leaving behind a proton, an electron, and a neutrino. These neutrinos are bizarre in that they practically do not interact iwth matter, passing straight through the Earth without slowing down or interacting with anything. That makes them hard to study. But it makes them very intriguing for understanding the very concept of existence. So are neutrinos the key to understand the very concept of our existence? Take this analysis from CNN, which might help illuminate the concept a little more. If we were to find that neutrinos were essentially their own antimatter particle, it could help us understand antimatter. And that is why scientists are so laser focused on it.